Although the world has witnessed many drastic changes in 2017, the changes that took place in Saudi Arabia might have been the most shocking ones. Those shifts, albeit shocking, were deemed necessary after a major drop took place in both the petroleum industries and the real estate market in Saudi Arabia. As the owner of the world’s second largest oil reserves, the Kingdom of Saudi Arabia (KSA) has been economically dependent on the petroleum industries for long decades. As a matter of fact, we would not be exaggerating if we said that it, along with the real estate market in Saudi Arabia, was the sole backbone for the kingdom’s economy. The oil industries contribute 30-40% of the Saudi Arabian GDP, not to mention the other sectors that are related or dependent on the petroleum industry. This was caused not only by the kingdom’s abundance of fossil fuels, but also by the conservative nature of its society. It was relatively more difficult for Saudi Arabia than its competitive neighbors to attract investors of different industries like tourism and entertainment. Thus, the Saudi Arabian economy was hit the hardest by the downfall of the oil prices that took place in the last couple of years. Such downfall was caused by the discovery of large oil reserves in other countries around the world (e.g. North Carolina in the United States) on one hand, and the world’s slow-but-continuous shift towards clean energy sources on the other. (Note: this article is about the outlook of the Saudi Arabian real estate market at the beginning of the year 2018; you can visit the following link for our review of the Saudi real estate market’s performance in 2018). How did the oil prices’ drop affect the economy and the real estate market in Saudi Arabia? It can be attributed to the Dominoes Effect; as explained earlier, the Saudi Arabian economic growth and sustainability was critically dependent on the oil industries. 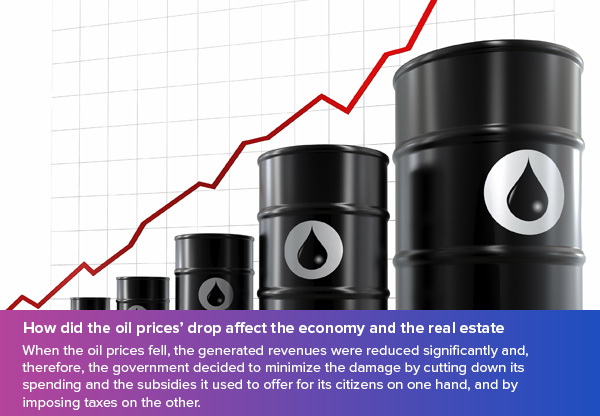 When the oil prices fell, the generated revenues were reduced significantly and, therefore, the government decided to minimize the damage by cutting down its spending and the subsidies it used to offer for its citizens on one hand, and by imposing taxes on the other. Locally speaking, this has weakened the Saudi Arabians’ purchasing power and their will to spend their money on acquiring new properties. Internationally, the downshift in the oil industry negatively impacted the investors’ interest in the kingdom, which contributed to a shattering blow to the energy industry employment rate. It is also worth mentioning that the expats play a major effective role. As a matter of fact, more than 650,000 expats are expected to leave KSA by the year 2020. This led to the rise of the calls for the Saudization (known as Nitaqat in Arabic) of the local jobs on one hand, and a negative impact on the real estate market on the other. This did not happen in Saudi Arabia only, but in all of the GCC region; but again, Saudi Arabia was impacted the most by it because of its sole economic dependence on oil prices. Eventually, the real estate market in Saudi Arabia suffered a reduced demand, which naturally led to the downfall in its prices. Also one of the reasons behind the drop in the level of the market demand is Nitaqat system which aims at reducing the expats working in KSA and increasing the employment rate of the Saudi Nationals. To read more, check our blog on Saudization policy and its effect on real estate. Despite the struggles it has gone through in the last two years, the real estate market in Saudi Arabia maintains an overall positive outlook due to the multiple reforms that are being currently planned and executed by the Saudi Arabian government. The most notable of these reforms come as major parts of Saudi Vision 2030 and the National Transformation Program. These reforms aim at overcoming the multiple obstacles that are facing the residential sector of the market like the high land prices and the imbalance between demand and supply. Like most of the major countries of the GCC region, KSA introduced a 5% value-added tax to help revitalize its economic status. The tax took effect on the first day of the current year, and it includes most goods and services with a few exceptions. Although many investors have expressed their concerns regarding the new tax, especially considering the fact that the citizens of the kingdom have lived a tax-free life till 2017, it is important to mention that VAT is applied in most of the countries around the world and with percentages that reach up to 15% in some places. On the other hand, KSA is taking many measurements to counter and reduce the negative effect of the tax on the investment environments and the purchasing power of the residents, especially in the real estate market. For starters, public services and residential rent are exempted from the tax. Also, VAT is not to be applied on selling properties to relatives up to the fourth degree. Thus, VAT’s negative effect on the real estate market is expected to be minimal. For more on this topic, see the effect of VAT on the real estate market of Saudi Arabia. In April 2017, KSA levied a 2.5% White Land tax to help making good use of the idle residential and commercial lands in Riyadh, Jeddah and the Eastern Province. The new law required the owners of lands that are 10,000 square meters or more to pay 2.5% of the land’s value as a tax or to start building on it within 12 months. According to a report issued by Ernst & Young on the matter, this tax is expected to help increase the supply of the affordable residential units by 400,000 units. The new tax also aims at ensuring fair competition and combatting monopoly, as well as reducing the land prices to a reasonable extent. In line with Saudi Vision 2030, the Saudi Arabian Public Investment Fund (PIF) and Ministry of Health (MOH) launched the Saudi Real Estate Reliance Company, a joint venture that aims at increasing home ownership by more than 50% before 2020. The company provided more than 280,000 products within 2017 including 85,000 facilitated loans, 77,000 developed residential lands, and 120,000 residential units. Because of the decreased governmental revenues and their weakened purchasing power, the Saudi Arabian residents have turned from purchasing villas towards affordable apartments. This has lead into a slowly increasing demand on apartments that is expected to continue growing within the upcoming years. To put it in numbers, the average price per square meter for villas has decreased by 5% in Riyadh, 24% in Jeddah, and 28% in the Eastern Province. On the other hand, the average price per square meter for apartments has increased by 36% in Riyadh, decreased by 7% in Eastern Province while it was mostly stabilized in Jeddah. As the capital, Riyadh is considered as the most important real estate market in Saudi Arabia. Unfortunately, there has been an imbalance between the demand on the units for low- and middle-income market segments and their supply. The real estate market demand is expected to continue surging up within the upcoming years. However, the supply is expected to catch up soon as well due to multiple reasons including increasing urban developments and the city expansions, and the housing programs supported by the Saudi Arabian Ministry of Housing. Sakani housing program, for example, has provided around 38,000 products during 2017 that included subsidized loans, developed residential lands and residential units in Riyadh. According to a report issued by Knight Frank, the residential units’ supply is expected to increase by the annual rate of 2% on yearly basis till 2020. As the second largest city in KSA, Jeddah’s increasing population is expected to affect the real estate market demand positively as it is predicted to increase by 2.5% on annual basis from now till the year 2022. Again, the demand in Jeddah, especially in the middle- and low-income segments, was faced with insufficient supply in the recent years. This issue is predicted to prevail through the upcoming years. However, the housing programs offered by the Ministry of Housing are expected to help resolve this imbalance and continue what it has started last year. In 2017, as a part of Sakani program, 32,000 products have been provided in the province of Makkah. This supply is expected to grow as more patches of the housing programs continue to be released. Same as Riyadh, the residential units’ supply in Jeddah is expected to increase by the annual rate of 2% on yearly basis till 2020. The case here is a bit different, as the Eastern Province houses most of the kingdom’s oil production. The real estate market demand of the province has been significantly negatively impacted by the drop in oil prices, an impact which is expected to last on the short term. This caused an imbalance in the market between its demand and supply. However, the white land tax, along with the supported housing programs, have helped reinvigorating the real estate market of the province. In 2017, 25,000 subsidized products have been distributed among the residents of the Eastern Province as a part of the first 8 patches of Sakani program. The Saudi Vision 2030: how does it affect the kingdom’s real estate market? During the last year, the Arabian Peninsula’s biggest kingdom has witnessed many shifts in its social norms and laws. The most notable of these changes could be seen in the slow-but-steady movement towards enabling women, starting with lifting the driving ban on the Saudi Arabian women. However, the biggest and most obvious change came before that in April 2016, when crown prince Muhammad bin Salman announced the launch of Saudi Vision 2030. A year and a half later, in October 2017, bin Salman announced more details of the vision along the launch of the mega project Neom City, the first transnational economic city in the region. The vision aims at helping KSA survive the economic crisis it is going through right now through shifting its focus to the development of the non-oil economic and the public service sectors. At the top of the list of these sectors come the clean energy industry and the real estate market in Saudi Arabia. To summarize, the downfall of the real estate market in Saudi Arabia is expected to last on the short term. However, the decline is predicted to decelerate till the market prices bottom out with the help of the Saudi Arabian government newly-levied laws and policies and the movement towards increasing the dependence on the non-oil economic sectors. Market Trends 3D Printed Homes: How is it changing the housing and construction sectors?